Chicago Public Schools teachers had been threatening to strike on May 1 over budget and staffing concerns, but now it’s been confirmed that the 1-day walkout will not happen. 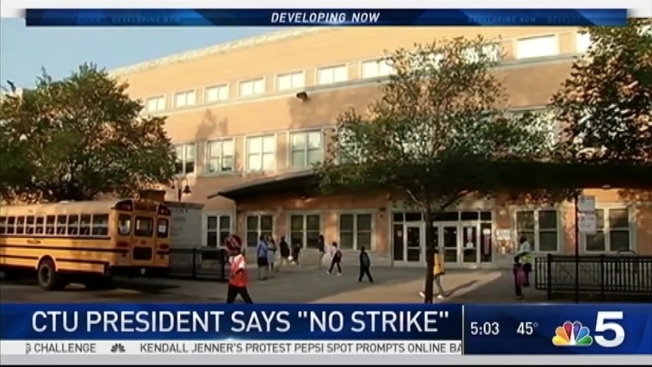 NBC 5’s Lauren Petty reports. It appears Chicago Public Schools teachers won't be walking off the job on May Day. In an interview with the Chicago Tribune Tuesday, CTU president Karen Lewis said the union’s House of Delegates will consider a proposal that keeps teachers on the job, allowing for Chicago Public Schools students to be in the classroom on May 1, but also asks them to show support for planned demonstrations on May Day. Lewis said the topic will be discussed in what is expected to be a heated debate at Wednesday night’s delegates meeting. Last month, teachers were asked to consider a one-day strike on May 1 after CPS threatened to cut the school year short by several weeks to save money. It was an idea of a strike was met with mixed emotions by teachers, according to the Chicago Sun-Times, who are already facing several unpaid furlough days, including one on Friday. The strike vote was expected to take place at Wednesday’s meeting, but now the delegates will likely vote on a different proposal instead, one that encourages teachers to take part in May Day activities to show solidarity with laborers without walking off the job. Wednesday’s House of Delegates meeting is planned to get underway at 4:45 p.m.